Twenty nine years ago, I graduated from high school. 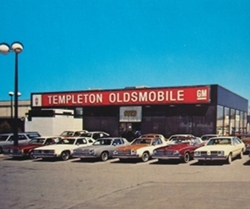 While many of my high school classmates went immediately to various mid-Atlantic area beaches to celebrate beach week I started work at Templeton Oldsmobile in Tysons Corner, Virginia. It was my summer job before college. The dealership is long gone, an Audi dealership now resides there. The official job title was lot attendant. The job was simple, I would prep new cars for customer delivery along with other duties. That’s the car dealership speak for wash new car exteriors, vacuum new car interiors, and detail new cars for the dealership’s customers. 1987 was one of the hottest summers on record in the Washington D.C. metro area and I had stupidly picked a job where I would spend 90% of the time either outside or in a hot garage bay area with no air conditioning. Short moments spent during the day in the cool air conditioned car showroom and behind the wheel of a new air-conditioned car where my only escapes from the intense heat and humidity. My solution to the problem was wearing a pair of Vans Slip-On shoes (with no socks), a surfing t-shirt, and a pair Billabong surfing trunks with pockets. The latter helped when I washed cars and sometimes inadvertently got my trunks wet, since the trunks would dry much quicker than regular pair of pants. Visualize a blond haired college bound male dressed like Jeff Spicoli but with short hair and you’ll get the idea. And yes the Vans were the black and white checkerboard pattern just like Mr. Spicoli’s. At the time Oldsmobile was an upscale brand. It was just a small step below Cadillac. Luxurious interiors and appealing conservative exterior styling were what Oldsmobile offered. There were many happy Oldsmobile customers during the 1960s, 1970s, and for most of the 1980s. For 1985, Oldsmobile had downsized (mini-sized is probably a better word) its bread and butter full size flagship luxury car – the Ninety Eight. 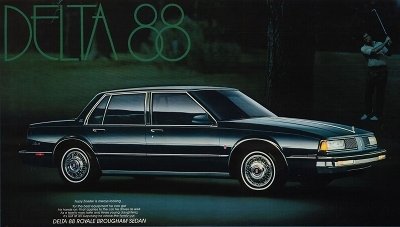 The Eighty Eight which was a luxury scale notch below the Ninety Eight but still offered many great options and plenty of luxury for buyers, also received this downsizing treatment for 1986. Both cars were very popular with buyers when they were rear-wheel drive. The new much smaller front-wheel drive versions sold well at first but soon after a few model years encountered tumbling sales. GM’s master plan of downsizing many of its popular rear-wheel drive cars by moving to much smaller front-wheel drive platforms would prove to be market share suicide in the long run. By the early-1990s, GM’s market share was shrinking heavily and Oldsmobile was on the ropes like a badly beaten prize fighter. GM may have thought it was just downsizing Oldsmobiles but it killed Oldsmobile’s unique identity. Oldsmobile was forced to sell upscale front-wheel drive cars which from the exterior looked to many buyers like the same ones Chevrolet was selling for much lower prices. Oldsmobile tried everything to remake its image to sell its new smaller cars, unfortunately its customers went elsewhere. Even slick marketing campaigns like “This Is Not Your Father’s Oldsmobile” didn’t work. GM closed Oldsmobile’s doors permanently in 2004. Pontiac would suffer the same fate a few years later. Buick also went through the same pains that Oldsmobile encountered with trying to adapt to selling smaller front-wheel drive cars. Buick would have also bit the dust had it not been for strong sales in China. Hard to believe but a majority of Buick sales today occur in the Chinese market. It didn’t take a genius to realize that GM’s downsizing of popular rear-wheel drive cars to much smaller front-wheel drive cars was a disaster. I could see it on the customer’s faces back in 1987. These were loyal customers many of them were repeat Oldsmobile buyers spanning over a decade. They may have been talked into buying a new downsized 1987 Ninety Eight or Eighty Eight but many were disappointed. It was hard for them to swallow paying a premium price for a lot less car than the Oldsmobile they were trading in. There may have been the nice luxurious velour and leather interiors along with plenty of power and convenience options but the fact remained the Ninety Eight and Eighty Eight were just about the same external size as a front-wheel drive A-body Oldsmobile Cutlass Ciera. A loaded with all the options Ninety Eight was $25,000 back in 1987, a nicely equipped 1987 Cutlass Ciera could be purchased for half that price. Add a few thousand dollars to the Ninety Eight’s price and you had the price of a loaded Oldsmobile Toronado. The Toronado since 1966 had been Oldsmobile’s flagship 2-door luxury car. For 1986 it had been downsized from 206 inches to 187.5 inches. Even by today’s standards that’s a small car. That’s about an inch shorter than a 2016 Mustang. GM would try to fix the situation by increasing the Toronado’s length to 200.3 inches for 1989 however the wheelbase remained the same short 108-inches as the 1986-1988 Toronado. GM would also increase the length of the Ninety-Eight and Eighty-Eight for 1991 and 1992 respectively but the wheelbase on both cars remained the same 110.8 inches as the cars they replaced. The overall lengths may have improved on these cars to give buyers the impression of being bigger cars but the interior sizes remained the same and they were still front-wheel drive cars. 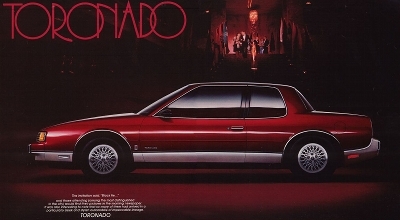 These changes didn’t make any difference since the Ninety-Eight, Eighty-Eight, and Toronado would be cancelled due to faltering sales long before Oldsmobile bit the dust. The reason was simple, the customers had left and would never return. 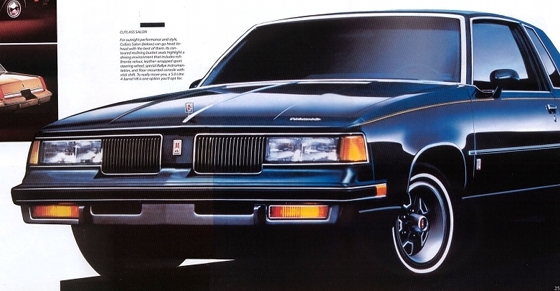 Oldsmobile may have been touting its new front-wheel drive cars back in 1987, but the Olds models that appealed to me that summer were the 2-door Cutlass Supreme, 4-door Cutlass, and the Custom Cruiser station wagon – all were rear-wheel drive. When equipped with the optional Oldsmobile 5.0 liter (307 CID) V8 (it was optional in the first two and standard in the latter) these cars were fun to drive around town or cruise on the highway. At the time I was driving my family’s 1985 6000 LE which was equipped with the Pontiac 6000 STE’s 2.8 liter MPI V6 and Y89 performance handling suspension. The Y89 included meaty factory equipped Goodyear Eagle GT performance tires and all the handling goodies standard on the 6000 STE. This 6000 LE had a sporty two-toned exterior paint scheme, a plush velour interior, loaded with options, and had spoke wheels. It was the only factory equipped car I ever saw with spoke wheels and raised white letter high-performance tires. This 6000 LE performed exactly like a 6000 STE so it was a fun car to drive. The 6000 was front-wheel drive and though it produced 130 horsepower which was a lot of horsepower back then (in a relatively light car) I preferred driving a rear-wheel drive V8 powered car at the time and this is still the case today. For me there was just something so special about the V8 powered rear-wheel drive Oldsmobiles. At the time many looked upon these cars as being outdated. The 1987 Cutlass platform had been around since 1978 with only minor exterior and interior updates from time-to-time. If GM had kept the rear-wheel G-body platform instead of moving to its replacement, the front-wheel drive W-body, Oldsmobile may still be around today. Oldsmobile could have easily given modern aerodynamic body styling (that would have appealed to many potential buyers) to the G-body before the 1990s allowing it to keep 2-door and 4-door Cutlass sales healthy. There weren’t any new Oldsmobile 442s left on the lot when I started working in early June. The 442 was Oldsmobile’s flagship rear-wheel drive performance car and 1987 was its last year in rear-wheel drive form. Templeton had sold its 1987 442 allotment before I arrived. I did have the memorable opportunity of driving one that summer when a customer (who had purchased a black 1987 442 a few months prior had been promised a wash and a full detail from the salesman who sold him the car) dropped off the car. It may have been a short drive from the sales office down to the back part of the lot to the car washing area. In reality it was like transversing two big parking lots since the distance was long compared to most car dealerships at the time. I put the windows down so I could hear the beautiful symphony of sounds emanating from the dual resonator low restriction dual exhaust system. It was a rare sound on the lot where many of the new cars had whiny sounding fuel-injected V6s or muffled V8s that were quieter than the Mohave desert. When I pulled into the car washing bay, I sat behind the driver’s wheel for a couple of minutes listening to the soft rumble of the Oldsmobile 5.0 liter (307 CID) H.O. V8 at idle. When I realized I needed to get back to work, I pressed the power window controls to close the side windows and then shut off the motor. Next I washed and detailed the 442. As I washed the car I realized it was an end of an era. The rear-wheel drive V8 powered 442 would never again return. It may have only had 170 horsepower (down 10 horsepower from 1986) but it still was 30 horsepower more than the regular run of the mill Olds 5.0 liter (307 CID) V8 found in the remaining rear-wheel drive 1987 Oldsmobiles. The 1987 442 ran a consistent 9 seconds in the 0-60 mph run – back in 1987 that was a quick car. This was important but it was the 1987 442’s character that mattered which was comprised of a performance oriented V8, a great sounding free-flow dual resonator exhaust system, a honest to goodness 4-bbl carburetor, a calibrated for performance 200-4R 4-speed automatic transmission, a well-tuned handling suspension with tight steering, and fantastic good looks. The enjoyment of the drive back to the sales office was the exact repeat of the drive earlier to the washing bay. Part of my job duties included running errands or driving a salesman to one of the two satellite lots that were a few miles away to pickup a new Oldsmobile for a customer to test drive and/or purchase. The dealership had these lots since they had a immense inventory which was too large for even the main massive dealership lot which also was populated with many new Yugos (a story for a later date). I chose different cars on the main lot for these occasions. For one week I picked a light blue 1987 Cutlass Salon for this duty. It was loaded with all the options including removable T-top roof panels and it had the upscale optional 14×6-inch aluminum wheels instead of the 14×6-inch steel rally wheels that most 1987 Salons came equipped with – the 442 was the only 1987 Cutlass to have 15-inch wheels. A few of the days I took the T-tops off when I drove the car. The Salon was the Cutlass model that the 442 was based on, due to the Salon being standard with sporty bucket seats, a leather wrapped steering wheel, a sporty rally gauge cluster, and an automatic shifter that resided in an attractive center console. The blue Salon was a blast to drive it handled about 90% as a good as a 442 and its 140 horsepower 4-bbl 5.0 liter (307 CID) V8 felt peppy especially with 255 lb-ft of torque available very low on the rpm scale. Though not the sheer muscle car the 442 was, the Salon definitely had the same overall feel of many old muscle cars but was a little more civilized with a very quiet single exhaust system. Its suspension did a much better job of absorbing potholes and road imperfections than the 442. I wanted to use the Salon for a longer period of time but I couldn’t rack up a lot of miles the new cars hence the changing to different cars on regular basis. One of the nights I was off, the Salon was sold to its new owner. I wonder if the car is still around today and if the owner realized those extra 30 miles on the odometer when the car was purchased had been enjoyed by the lowly lot attendant?